Richard was appointed the UK and Ireland representative for the BBAG in 2009. Richard has considerable success with horses bought from and sold to Germany. His purchases from Germany include recent Listed winning hurdler NYANZA (purchased as a yearling from BBAG for €26,000), Grade 1 winning hurdler UNITED and Grade 2 winner EL DANCER, together with other high class performers including LORD OF HOUSE and BACKBORD. Horses he has purchased on behalf of German clients include 2009 Group 2 winner KING OF SYDNEY and Group 3 winner MOOD MUSIC. Other successes include THREE FRENCH HENS (Listed winner in Germany in 2010), ARABIAN FALCON (Listed winner in Germany in 2012), IT’S A PRIVILEGE (multiple winner in Germany in 2014 – see photo, bottom left) , LORDSBURY PRIDE (winner of 11 races) and many more. Richard is assisted in Germany by Heidrun Küster. 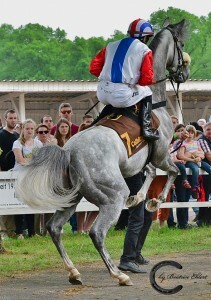 Heidrun (pictured right) is based near Frankfurt and has a real passion for the thoroughbred. She has followed the sport closely for the last twenty years and regularly attends race meetings in Germany as well as many major European fixtures. 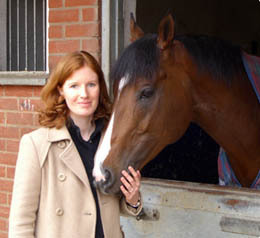 Heidrun has an extensive knowledge of the people and horses in the German racing industry and has the added advantage of being fluent in English. She is an invaluable asset to Richard Venn Bloodstock Ltd in Germany. Heidrun has also developed a unique website www.siegerlisten.com where she posts the results of all the major races in the World. Subscribe to our RSS feed to keep up to date with the latest news from our site. Richard Venn Bloodstock Ltd Copyright © 2012. All Rights Reserved.